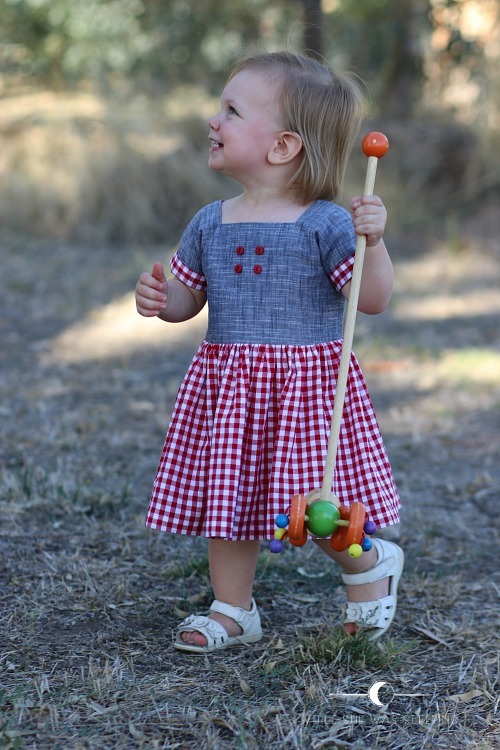 After teasing you on Instagram for almost a week it is time to reveal the big secret... Suz from Sewpony has released a new pattern, the Dulcie dress! What? You knew that already? But did you know this pattern is FREE? Yes, that's the secret I have been bursting to tell! 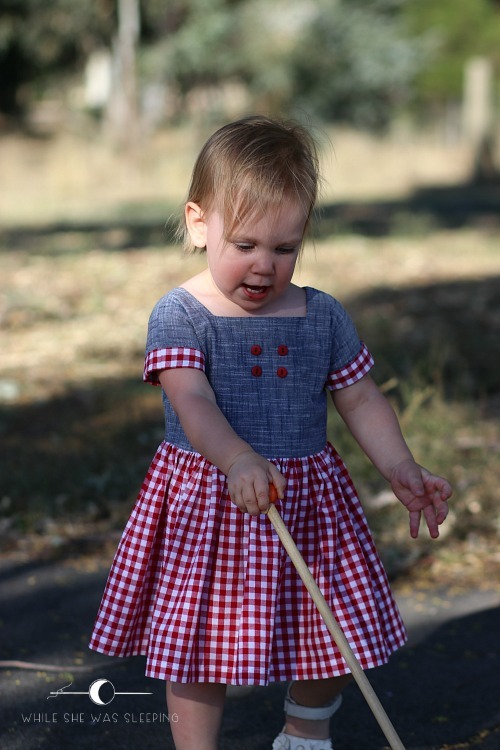 Because I am good at keeping secrets (I also have a child in the right size) I had an opportunity to test the Dulcie dress pattern for Suz. Please note the dress you see in this post is a test version. Suz has made a few adjustments to the fit of the dress after the first round of testing. She has perfected the neckline and lowered the sleeves a little to allow more room for movement. I am not showing you the back of this dress because this version does not reflect the final product. I have had so much fun sewing this dress! 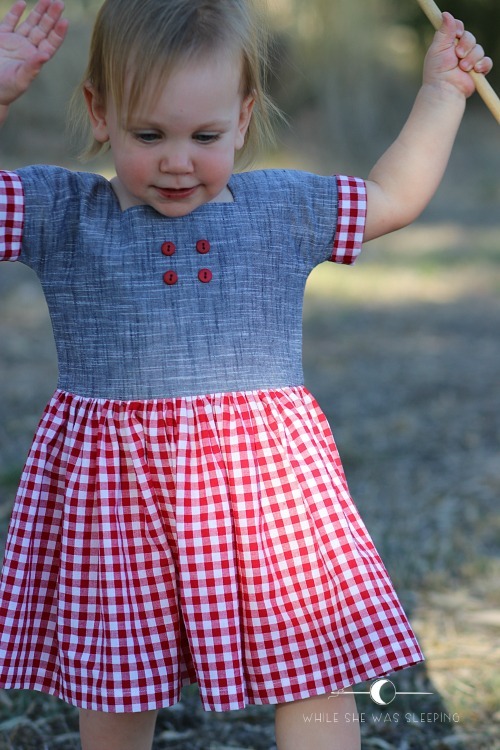 I used voile for the bodice and red gingham for the lining and the skirt. When I finished sewing the dress it was still asking for something little. I think four small buttons on the front of the dress is just the right finishing touch. The sleeves are integrated with the bodice. Additional sun protection without the headache of setting in the sleeves? Yes please! Sleeves may be made plain or with a cuff. Suz offers a square neckline, a rounded neckline, and a half pointed collar. Another lovely option is square patch pockets. The dress closes with an invisible zipper. 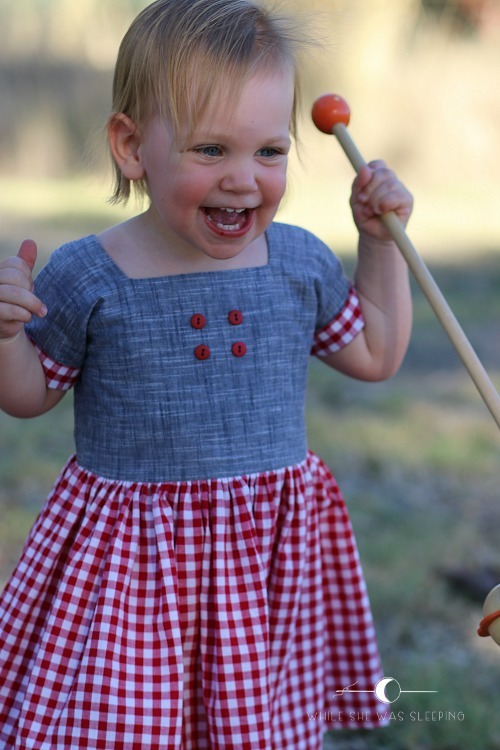 The pattern is easy, a confident beginner will be able to sew the Dulcie dress without hiccups. 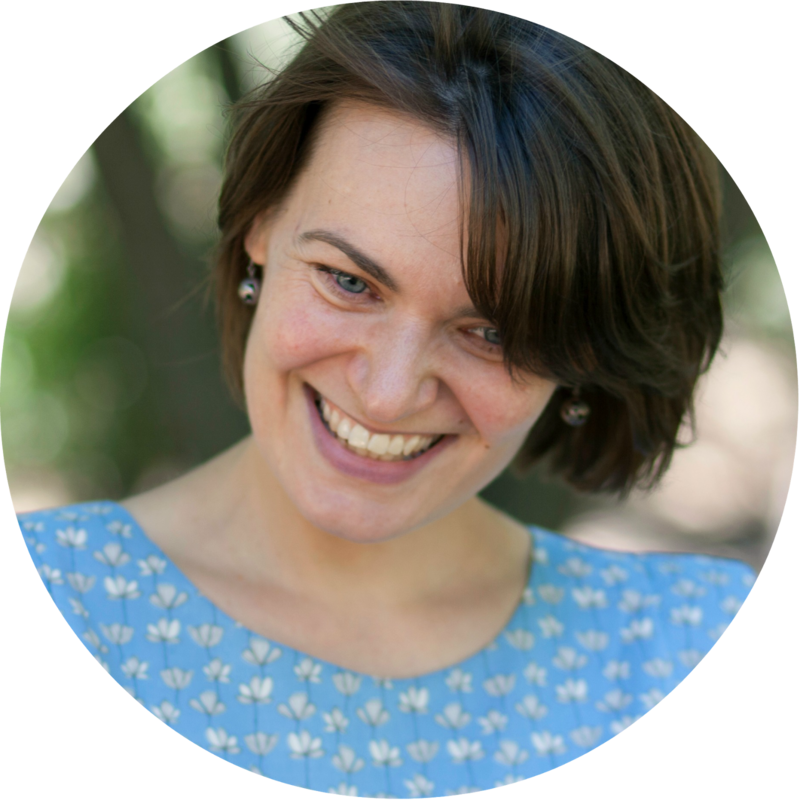 For those who don't require a step by step guide Suz offers an overview. Those who prefer more detailed instructions will be pleased with the quality and clarity Suz explains every step, including understitching (never ever skip this step!!! ), zipper installation as well as tips on making your own piping. 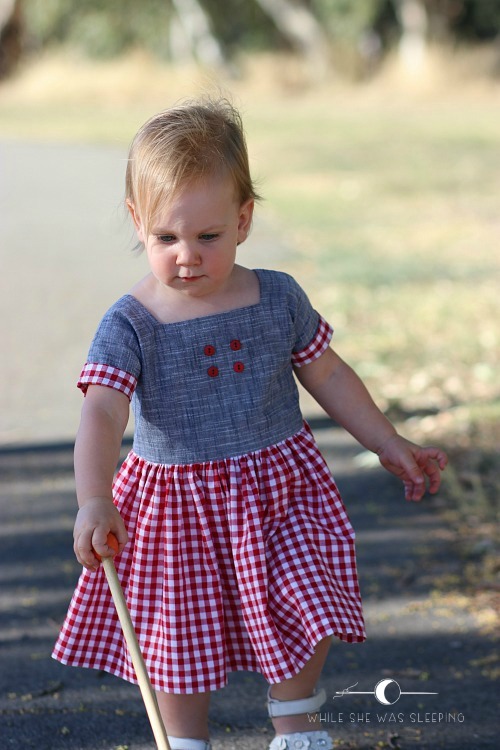 Would you like to sew the Dulcie dress? 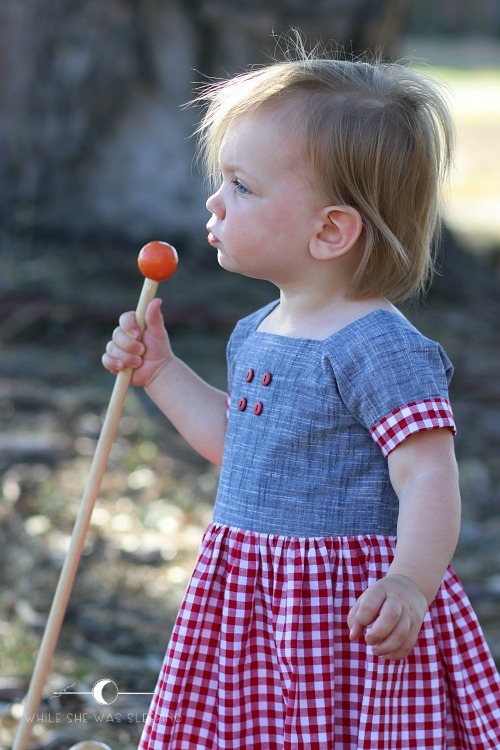 Head over to Sewpony to find out how you can receive this free pattern. Make sure you follow Sewpony as a little birdie told me there are a few more surprises coming our way over the next few Fridays. A few of my co-conspiring testing buddies are sharing their dresses on social media today, so make sure you visit Miranda, Zoe, Anke, An, Iris and Emi. 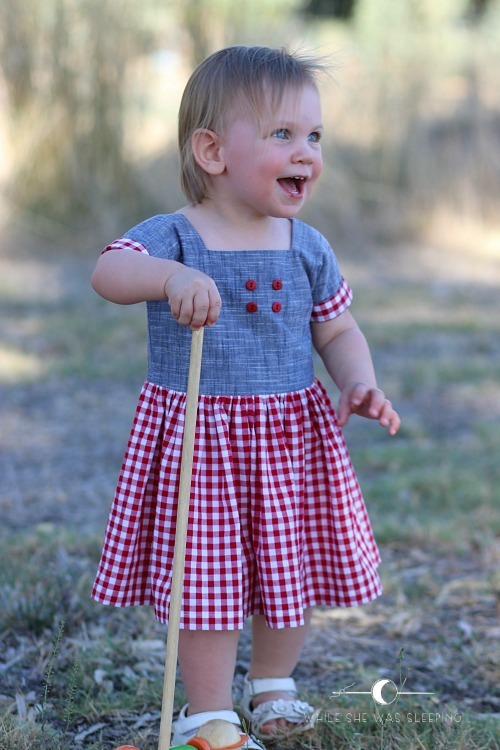 You can also check out #dulciedress and #sewponypatterns for more inspiration. This is so cute! 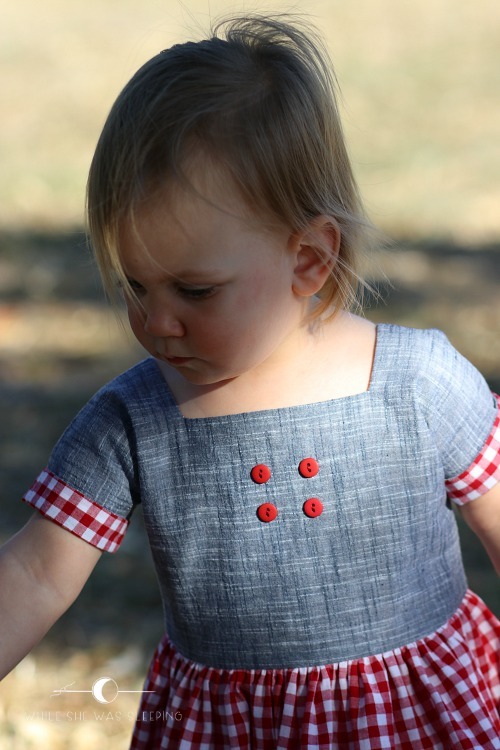 Love the square neckline and adding the buttons is super! hahaha I did enjoy teasing, perhaps a little too much! Thank you for your kind words Sylvia. This is such a sweet version of the dress! I really love the fabric combination and the addition of the buttons. So great! 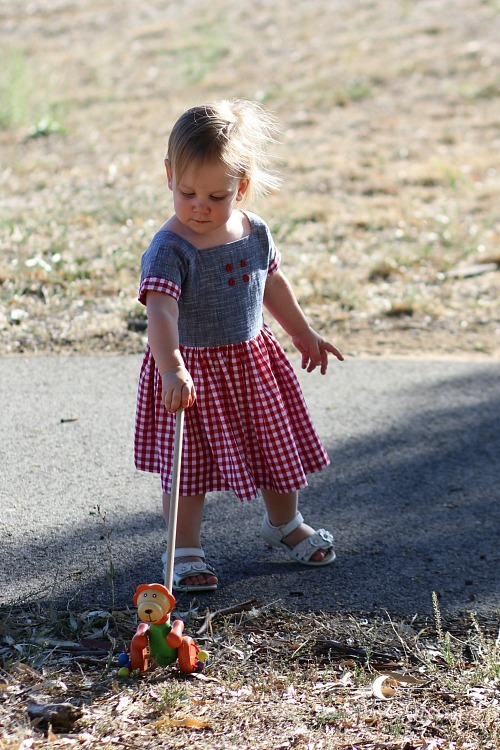 Look at your sweetie, too, toddling around like such a big girl! How old is she now? I feel like she looks like you. Am I right?